City organ­isa­tions includ­ing Roy­al Haskon­ing DHV, Skanska, Viridor and Coca Cola, Free Think­ing, I3 Media and Rail­world, today atten­ded a sign­ing cere­mony com­mit­ting sup­port to cre­ate a Cir­cu­lar Peter­bor­ough by 2050. Cir­cu­lar Peter­bor­ough, a Future Peter­bor­ough ini­ti­at­ive, delivered by Oppor­tun­ity Peter­bor­ough and Peter­bor­ough City Coun­cil, encour­ages col­lab­or­at­ive work­ing across the city to max­im­ise the life­cycle of products and ser­vices, driv­ing great­er resource pro­ductiv­ity, redu­cing envir­on­ment­al impact and address­ing declin­ing nat­ur­al resource issues in the future. The Cir­cu­lar Peter­bor­ough Com­mit­ment sets out an approach: rethink­ing; redesign­ing; repair­ing; repur­pos­ing, reusing and shar­ing; reman­u­fac­tur­ing; recyc­ling and recov­er­ing products and ser­vices – the 7 Rs which enables the city to make the most of loc­al resources, sup­port eco­nom­ic resi­li­ence, develop strong com­munit­ies and increase envir­on­ment­al sus­tain­ab­il­ity. Organ­isa­tions who have signed the com­mit­ment are act­ively involved in devel­op­ing pilot pro­jects and ini­ti­at­ives which encour­age a more sus­tain­able approach to busi­ness in our city. Steve Bow­yer, Chief Exec­ut­ive of Oppor­tun­ity Peter­bor­ough and Pro­ject Dir­ect­or of the Future Cit­ies Pro­gram­me said ‘Put simply, if we con­tin­ue to use resources at the cur­rent rate, we will need three plan­ets worth to sup­port future gen­er­a­tions. Cre­at­ing a cir­cu­lar eco­nomy here in Peter­bor­ough starts at grass­roots with city busi­nesses com­mit­ting to rethink the way they oper­ate’. Peter­bor­ough is being cata­pul­ted to new heights of inter­na­tion­al acclaim as its smart and sus­tain­able cre­den­tials are exhib­ited at the Smart City World Expo in Bar­celona this week (15 – 17th Novem­ber). After win­ning the title of “World Smart City 2015”, Peter­bor­ough was invited to show­case its cit­izen-centred approach towards cre­at­ing a smart city to an inter­na­tion­al audi­ence of more than 400 city lead­ers, influ­en­cers, busi­nesses and smart tech­no­logy innov­at­ors. Delivered by eco­nom­ic devel­op­ment com­pany, Oppor­tun­ity Peter­bor­ough, and Peter­bor­ough City Coun­cil, the Peter­bor­ough DNA pro­ject was formed four years ago after the city was awar­ded £3 mil­lion by the Tech­no­logy Strategy Board, (now Innov­ate UK) to test, develop and imple­ment new and smarter ways of con­nect­ing people, places and ser­vices. Now, as Peter­bor­ough pre­pares to hand over its title of World Smart City, Steve Bow­yer, Chief Exec­ut­ive of Oppor­tun­ity Peter­bor­ough has been invited to speak at the World Expo in Bar­celona to share the Peter­bor­ough suc­cess story with del­eg­ates from around the globe. The Smart City Expo takes place from 15 – 17th Novem­ber in Bar­celona. Oppor­tun­ity Peter­bor­ough and Peter­bor­ough City Coun­cil will be joined by a num­ber of part­ners and spon­sors at the exhib­i­tion, includ­ing: Arcus Glob­al, Brit­ish Stand­ards Insti­tute, Hon­ey­well, Blue Sky, Pin­sent Masons, MyCog­ni­tion and Folk Labs. From one of the UK’s four Future City Demon­strat­ors to win­ning Smart City of the Year, Peter­bor­ough hos­ted an event for city lead­ers, aca­dem­ics and industry experts from across the UK to share this jour­ney, the suc­cess and the les­sons learnt. 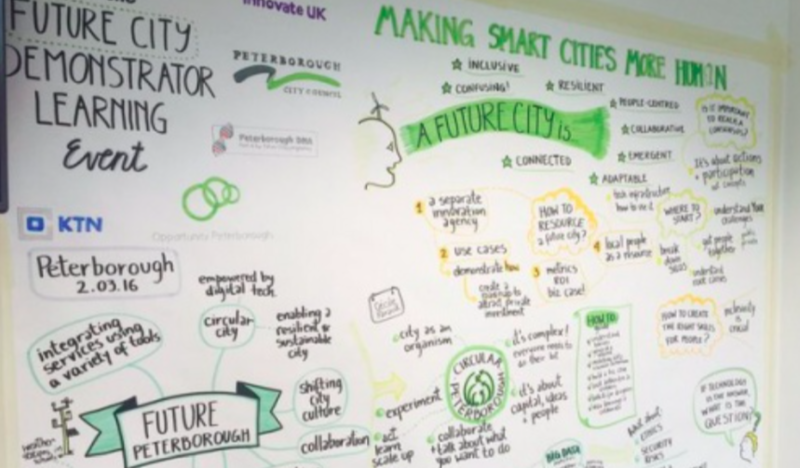 ‘Mak­ing Smart Cit­ies More Human’ was the title of a one-day con­fer­ence held at the Allia Future Busi­ness Centre, co-hos­ted by Innov­ate UK and Peter­bor­ough DNA, Peterborough’s Future Cit­ies pro­gram­me, delivered in part­ner­ship with Oppor­tun­ity Peter­bor­ough and Peter­bor­ough City Coun­cil. Future City Pro­grammes have become increas­ingly pop­ular in some of the world’s lead­ing cit­ies to help under­stand and address the increas­ing com­plex­ity of city life and its man­age­ment. In the UK, Innov­ate UK launched the Future Cit­ies Demon­strat­or pro­gram­me and awar­ded Peter­bor­ough a £3mil­lion grant to dis­cov­er the value that could be delivered to a city through integ­rat­ing city ser­vices and sys­tems. Show­cas­ing Peterborough’s cit­izen cent­ric approach, del­eg­ates heard about the pro­jects and ini­ti­at­ives that have been delivered in the three years since the pro­gram­me com­menced and the value added for busi­nesses, future skills and the city being named Smart City of the Year at the Smart City World Con­gress Awards at the Smart City Expo in Bar­celona in Novem­ber 2015. Mov­ing for­ward bey­ond the Demon­strat­or, del­eg­ates heard about Peterborough’s Cir­cu­lar City and Digit­al City aspir­a­tions which also included ‘Ques­tion and Answer’ Pan­el Ses­sions with some of the lead­ing people in the respect­ive fields includ­ing rep­res­ent­at­ives from Great­er Lon­don Author­ity, For­um for the Future, Cran­field Uni­ver­sity and BGL Group. In a world where driver­less vehicles cruise by, street lights mon­it­or CO2 emis­sions and lit­ter bins broad­cast break­ing news, it’s easy to lose sight of cit­ies as places for people. Digit­ally-enabled inter­ven­tions, powered by smart sensors and big data, can deliv­er a wealth of bene­fits for cit­izens. But if these inter­ven­tions are not executed in the right way, they can end up ali­en­at­ing the very people they are try­ing to help. Some of our most switched-on urb­an hubs are exper­i­en­cing an iden­tity crisis as we begin to ques­tion what exactly ‘smart’ is. If smart cit­ies are to remain rel­ev­ant then they must deliv­er more respons­ive exper­i­ences. When it comes to solv­ing some of our biggest urb­an­isa­tion chal­lenges – such as access­ible health­care and income equal­ity – a city is more likely to achieve suc­cess­ful out­comes if it dir­ectly engages cit­izens in that decision-mak­ing and assess­ment pro­cess. So how do we con­nect places, spaces, people and ser­vices in more intel­li­gent ways? City plan­ners and author­it­ies tra­di­tion­ally oper­ate a silo men­tal­ity when it comes to tack­ling key issues around ser­vice pro­vi­sion. There are dif­fer­ent depart­ments for dif­fer­ent dir­ect­or­ates; health, social care, edu­ca­tion, hous­ing, trans­port, and so on. Smart cit­ies tend to build on this silo approach; the danger here is that any smart inter­ven­tions lack cross-func­tion­al­ity and remain lim­ited in their scope. This can lead to lin­ear sets of data and ana­lys­is. Break­ing down these silos is the first step to smart cit­ies deliv­er­ing bet­ter value. Fos­ter­ing a cul­ture of open dia­logue and col­lab­or­a­tion between author­it­ies, depart­ments and key stake­hold­ers will enable a more integ­rated, city-led approach to ser­vice pro­vi­sion. The more diverse this level of lead­er­ship is, the bet­ter – and that’s where the cit­izen comes in. Factor­ing in a range of more human dimen­sions into city think­ing is key. Ima­gine a city as a ‘cat’s cradle’ archi­tec­ture of cit­izen inter­ac­tions. Under­stand­ing the nature of those inter­ac­tions, where they inter­sect and how they inter­lock with each oth­er, is import­ant. But we also need to work out how to influ­ence those inter­ac­tions for great­er effect so they deliv­er genu­ine value. Ask­ing the right ques­tions of any smart inter­ven­tion injec­ted into this archi­tec­ture can help us under­stand these inter­ac­tions bet­ter. Why does a res­id­ent choose to over­ride cli­mate con­trol sensors installed in their home? How can a city be car­bon-neut­ral if lack of afford­able hous­ing is for­cing com­muters to make longer jour­neys into its centre? At what point does per­son­al data gath­er­ing become too invas­ive that people opt-out? By con­sid­er­ing the human per­spect­ive, this type of learn­ing can help determ­ine wheth­er the inter­ven­tion is right (or wrong), while offer­ing a clear­er assess­ment of cost again­st impact. Going for­ward, smart cit­ies will increas­ingly depend on the par­ti­cip­a­tion of cit­izens in order to func­tion effect­ively, and this is some­thing we recog­nise with­in Peter­bor­ough. As one of only four UK Future City demon­strat­ors, we are pion­eer­ing a more inclus­ive approach for our urb­an envir­on­ment. We believe we are ahead of the curve in a num­ber of ways. Our Peter­bor­ough DNA Smart City pro­gram­me is demon­strat­ing the poten­tial of human inter­ac­tion with open data by mak­ing it rel­ev­ant on a num­ber of levels. One example is the 25 weather sta­tions we have installed at schools across the city which are provid­ing rich data on cli­mate and air qual­ity. The data col­lec­ted not only helps raise pupils’ aware­ness of the imme­di­ate envir­on­ment around them, but doubles up as a teach­ing resource and met­eor­o­lo­gic­al aid for stat­utory agen­cies. This effect­ively enables young people to act as intel­li­gence gath­er­ing agents, bring­ing to life the con­cept of ‘smart cit­izenry’. Another example is our Break­through Think­ing events. These are facil­it­ated work­shops where we bring diverse groups togeth­er face-to-face to think cre­at­ively about how to solve city chal­lenges around themes like zero waste. The focus is very much on ‘real world’ issues that cit­izens are exper­i­en­cing, wheth­er it’s redu­cing house­hold pack­aging waste, or pre­vent­ing old IT equip­ment from being dumped in skips. A Brain­wave Chal­lenge Fund offers up to £20,000 to turn these pro­posed solu­tions into real­ity. Our ambi­tion to be the UK’s first cir­cu­lar city will only deep­en this col­lab­or­at­ive approach to cit­izen involve­ment. How we integ­rate smart strategies with cir­cu­lar think­ing is a huge chal­lenge, but both are mutu­ally rein­for­cing. Like smart, cir­cu­lar solu­tions are increas­ingly enabled and con­nec­ted by the Inter­net of Things, but we must ensure these inter­ven­tions are demo­crat­ic­ally owned from the bot­tom-up, rather than imposed from the top-down. And where bet­ter to chal­lenge the status quo than with the next gen­er­a­tion? We have already asked young people to ima­gine what a cir­cu­lar Peter­bor­ough might look like through our Smart Sup­pers events. Har­ness­ing the power of cit­izens through a vari­ety of inter­ven­tions (human-to-human, human-to-machine, machine-to-human and machine-to-machine) will enable a city to build a smarter evid­ence base for decision-mak­ing. That’s not likely to be enough how­ever. How smart cit­ies meas­ure and eval­u­ate their per­form­ance going for­ward will be crit­ic­al, given grow­ing demands around trans­par­ency and gov­ernance. Met­rics in this field are still emer­ging, but include: PD 8101 – a set of guidelines for smart city plan­ning; the ISO 37120 indic­at­or report­ing stand­ard for city ser­vices and qual­ity of life; and the PAS 181 smart city frame­work, which Peter­bor­ough helped lead on. Peter­bor­ough has also developed its own self-assess­ment tool, a matur­ity mat­rix, which rates cur­rent pro­gress again­st stated aims. An action plan and roadmap is also being cre­ated for Peterborough’s cir­cu­lar city work in con­junc­tion with key stake­hold­ers. Lastly, remem­ber leg­acy. Smart cit­ies must look to provide not just scal­able solu­tions, but rep­lic­able mod­els that can be rolled out across oth­er urb­an envir­on­ments, regard­less of their size. Recog­nising the beha­vi­our of the city as a whole not only involves match­ing resource out­puts (such as waste heat) to resource inputs (loc­al dis­trict heat­ing net­works), but show­ing the bene­fit to ordin­ary people (afford­able warmth). Peter­bor­ough is plan­ning to cre­ate a series of applic­able blue­prints that can be repro­duced by any city aspir­ing to be smart, per­son­al and con­nec­ted. A group of busi­ness del­eg­ates and con­sult­ing pro­fes­sion­als from vari­ous indus­tries across Peter­bor­ough and fur­ther afield, took part in a prac­tic­al work­shop this week to learn more about how adopt­ing cir­cu­lar eco­nomy prin­ciples can bene­fit both their busi­ness and the wider city. The event, which was hos­ted at the Allia Future Busi­ness Centre, was delivered by the Know­ledge Trans­fer Net­work (KTN) as part of the Peter­bor­ough DNA Smart City pro­gram­me. Sponsored by Allia as part of the city’s Cir­cu­lar Peter­bor­ough ini­ti­at­ive — an ambi­tion to cre­ate a cir­cu­lar city to help Peter­bor­ough effi­ciently man­age the flow of its resources – the event sup­por­ted busi­nesses to take their first prac­tic­al steps towards cir­cu­lar­ity. The event began with an intro­duc­tion from KTN and the Peter­bor­ough DNA pro­ject team to help del­eg­ates under­stand more about the Cir­cu­lar Eco­nomy approach: what it is, the inten­ded out­come for the city, and examples of how it is already being used in Peter­bor­ough. Del­eg­ates then par­ti­cip­ated in group activ­it­ies to put the Cir­cu­lar Eco­nomy approach into prac­tice, to chal­lenge their usu­al way of doing busi­ness and explore ways to apply the prin­ciples to their own com­pan­ies. Steve Bow­yer, Chief Exec­ut­ive of eco­nom­ic devel­op­ment com­pany Oppor­tun­ity Peter­bor­ough, said: “Our vis­ion to become a Cir­cu­lar City will put Peter­bor­ough right at the front of smart city think­ing, re-enfor­cing our aspir­a­tion to make Peter­bor­ough a fant­ast­ic place to live and work. How­ever, to achieve that vis­ion, we need col­lab­or­a­tion on a city-wide scale, with rep­res­ent­at­ives from busi­ness, schools, com­munit­ies as well as city insti­tu­tions.